It has been an unbroken convention for decades now, to appoint the senior-most judge of the supreme court as the CJI. 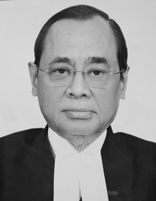 The present CJI is Justice Ranjan Gogoi, and is the 46th CJI since 3 October 2018. January 1950, the year the Constitution came into effect and the supreme court came into being. He succeeded Justice Dipak Misra on 2 October 2018, and will remain in office till 17 November 2019, the day he retires on turning 65 years in age. Article 124 of the Constitution of India provides for the manner of appointing judges to the Supreme Court. Though no specific provision exists in the Constitution for appointing the Chief Justice, who, as a result, is appointed like the other judges conventionally, the outgoing CJI recommends the name of the senior-most judge (i.e. by date of appointment to the Supreme Court) for appointment by the President of India, as his successor. A Judge of the Supreme Court shall not be removed from his office except by an order of the President passed after an address by each House of Parliament supported by a majority of the total membership of that House and by a majority of not less than two-thirds of the members of that House present and voting has been presented to the President in the same session for such removal on the ground of proved misbehaviour or incapacity. The Constitution of India gives the power of deciding remuneration as well as other conditions of service of the Chief Justice to the Parliament of India. Accordingly, such provisions have been laid down in The Supreme Court Judges (Salaries and Conditions of Service) Act, 1958. This remuneration was revised in 2006-2008, after the sixth central pay commission's recommendation. ^ "Supreme Court of India - CJI & Sitting Judges". Retrieved 4 July 2015. ^ "Supreme Court of India Retired Hon'ble the Chief Justices' of India". Retrieved 4 July 2015. ^ "Supreme Court, High Court judges get nearly 200% salary hike". The Hindustan Times. 30 January 2018. Retrieved 30 January 2018. ^ Narasimham, R L, Justice (CJ, Orissa H. C.). "Chief Justice Sinha - A Review of Some of His Decisions (page 5 of 8)" (PDF). Indian Law Institute. ^ Saxena, Namit (23 December 2016). "New Captain Of The Ship, Change In Sailing Rules Soon?". Live Law. Retrieved 24 December 2016. ^ Alok (26 November 2010). "How India missed getting its first woman Chief Justice India". Critical Twenties. Retrieved 4 September 2016. ^ a b "Article 124, Constitution of India". Vakilno1.com. Archived from the original on 26 December 2010. Retrieved 11 October 2012. ^ Venkatesan, J. (4 November 2015). "TS Thakur to succeed HL Dattu as new Chief Justice of India". Asian Age. Retrieved 5 November 2015. ^ "Seniority as the Norm to Appoint India's Chief Justice is a Dubious Convention". The WIre. Retrieved 24 December 2016. ^ "The High Court and Supreme Court Judges Salaries and Conditions of Service Amendment Bill 2008" (PDF). PRS India. ^ "Supreme Court Judges (Salaries and Conditions of Service) Act 1958" (PDF). Ministry of Home Affairs, India. Archived from the original (PDF) on 4 January 2011. Retrieved 23 July 2012.